Click here for more in-depth data. 1. Samsung boss faces jail time: Prosecutors in South Korea's "trial of the century" have demanded a 12-year jail term for the country's highest profile business leader, Lee Jae-yong. Lee, the de-facto leader of Samsung, is facing charges of bribery and perjury. He is accused of playing a key role in the corruption scandal that led to the ouster of former President Park Geun-hye. Samsung shares trading in Seoul were down 0.3% on Monday. 2. Consumers hit by Brexit: U.K. consumer spending fell for a third consecutive month in July, according to a new report by Markit for Visa. Spending on transportation, communication, footwear and clothing took the biggest hit. British consumers are feeling the squeeze of higher prices and uncertainty over the country's exit from the European Union. Britain's impending departure the EU caused a steep drop in the value of the pound, leading to higher import prices and rising inflation. The pound was trading at $1.30 early Monday morning, 13% lower than the day of the Brexit referendum in June 2016. 3. 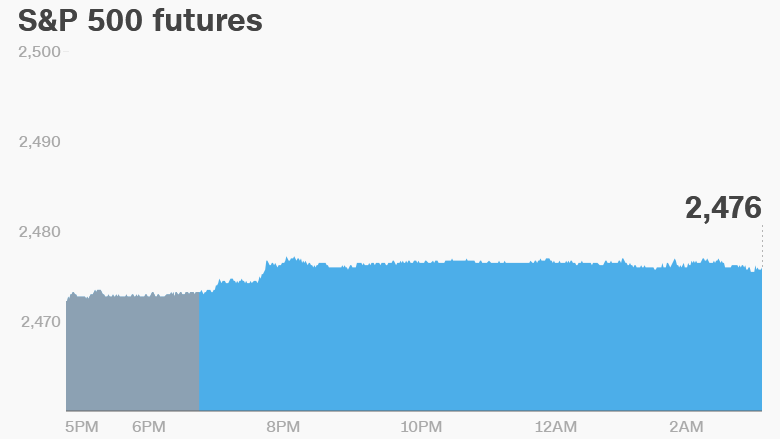 Global market overview: U.S. stock futures were higher on Monday, pointing to another day of gains on Wall Street. CNNMoney's Fear & Greed Index is firmly in greed territory. The Dow Jones industrial average closed up 0.3% on Friday, while the S&P 500 and the Nasdaq both gained 0.2%. European markets were mixed early on Monday, while Asian markets ended the session mostly higher. 4. Earnings and economics: Marriott (MAR) is set to release earnings after the close on Monday. The stock is up 27% so far this year. CBS (CBS) is also scheduled to report after the closing bell. German industrial production fell 1.1% in June compared to the previous month, reversing almost all of the gains made in May. Still, the German economy is expected to grow strongly this year.